Marco Rubio has voted to ban late-term abortions. He has flaunted his personal "pro-life" stance in dozens of interviews. He has sponsored bills banning pregnant teenage girls from traveling across state lines for abortion care. But the young senator from Miami has also gone on the record in the past acknowledging that "a woman's right to an abortion is the law." So why, then, is Rubio stacking his campaign team with anti-abortion politicians who possess views so militant about women's rights that one would think they came directly from a Margaret Atwood novel? In late June, Rubio announced via Twitter that his campaign hired Zach Wamp, a former Congressman and one-time gubernatorial candidate from Tennessee who has openly endorsed secession from the United States over the Affordable Care Act and abortion. According to Rubio, Wamp will be helming the Team Marco campaign in Tennessee. Earlier that month, Rubio hired Iowa State Senator Rick Bertrand to head the Team Marco campaign in the Hawkeye State, where his campaign is well underway. Rubio praised Bertrand's legislative work and "blue collar roots," claiming the state senator was a perfect example of "the opportunity we must create for all Americans." To those who live outside Tennessee and Iowa, these names are most likely unfamiliar. But to many Tennesseans and Iowans, Wamp and Bertrand are known for their uncompromising social conservatism — including crusades against abortion rights that could end up sending women and their doctors to prison for life. Protecting life defines who we want to be as a society. All life is worthy of protection, and all life enjoys God’s love. I believe that Roe v. Wade was not only morally wrong, but it was a poorly decided legal precedent and should be overturned. I have a record of supporting pro-life policies, and will continue to do so in public and private life. I believe that as a nation we must always come down on the side of life. We must speak up for those who cannot speak up for themselves. 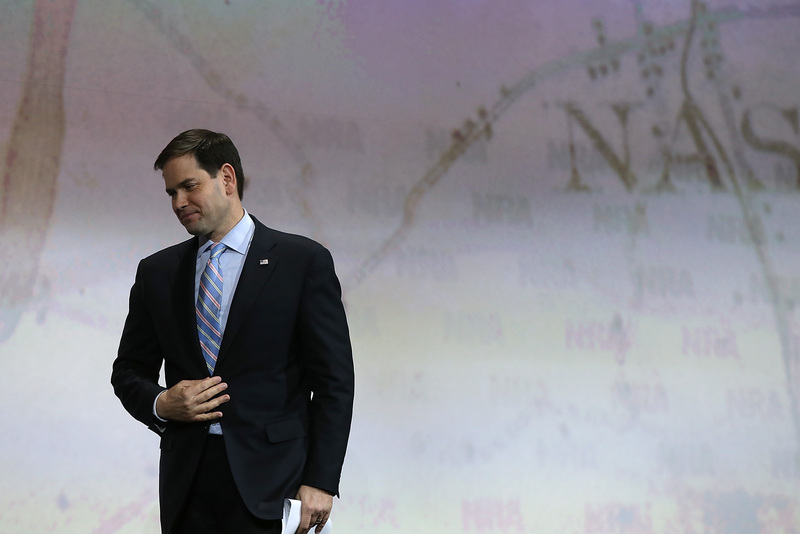 Despite the rhetoric, Rubio's position is vague. He doesn't say outright that abortion should be illegal in all 50 states, though Planned Parenthood has noted to Bustle that the junior Senator has supported policies that would ban safe and legal abortion. And like most conservative politicians running for office, he doesn't address the likely outcome of banning abortion: placing women and their doctors in prison for undergoing or performing the procedure. But while Rubio lacks the words, his recent campaign hiring may end up doing a lot of the speaking for him. Rubio has put together an impressive roster of beltway bigwigs. He tapped former Mitt Romney operatives Terry Sullivan and Rich Beeson as his campaign manager and deputy campaign manager, respectively. But on the ground in Iowa and Tennessee, his two recent hires are a little less polished in style, and a little (or a lot) more ideological in substance. Take Bertrand, who's now heading Team Rubio in Iowa. In March, Bertrand introduced the Life-at-Conception Act, which would end legal abortion, at any stage. It's one of the most extreme personhood bills introduced in America yet, going so far as redefining abortion as murder under the state's penal code. The text of the bill states that murder would be considered under Iowa law as: "killing [of] another person through any means that terminates the life of another person, including, but not limited to, the use of abortion." That means abortion providers, and potentially women who choose to have abortions, could face murder charges. In other words, if someone kills an unborn baby, that murder would be treated just like any other murder here in Iowa because this baby is considered an innocent person just like any other murder victim would be. ... Simply put, the intentional killing of an unborn baby would have the same penalties and consequences of killing a gas station attendant during a midnight robbery. For pro-lifers like you and me, this is very simple. The anti-abortion group also thanked Bertrand, who has written campaign emails to the league's supporters in the past, for following through "on [his] promise to champion this important legislative project." The Iowa Pro-Life Action League did not respond to Bustle's request for comment about Bertrand's new position with the Team Marco campaign. Although the Iowa Pro-Life Action League doesn't explicitly say in its online statement the proposed legislation would leverage murder charges against doctors — or their patients — the group's social media trail shows it's is not shy about its position on punishment for abortion providers. Meanwhile, in Tennessee, former Congressman Wamp has taken over for Team Marco, to the dismay of reproductive health advocates there. A staunchly anti-abortion politician with Todd Aiken's eloquence, Wamp has gone on record saying the city of Chattanooga is "blessed" by God for not having any abortion providers (currently, Tennessee only has seven abortion clinics, six of which provide surgical abortions). Let me tell you one of the reasons why Chattanooga is a very blessed city today, why we have so much new economic development and why we're really an anointed city. There are no abortion clinics in Chattanooga. We made a decision. We made a decision a long time ago that we were going to work as a community to not allow abortion clinics in our city, and I got to tell you we're trying to be after God's own heart. I mean it's hard to say that. Lincoln said, we don't claim to have God on our side but we strive to be on his. And that's the deal here. People who seek righteousness and the right thing are blessed and anointed. Our city is blessed. Our state will be blessed as we remove this scourge and plague of killing innocent children in the womb. That same year, Wamp also proposed that Tennessee secede from the federal government. At the time, Lt. Gov. Ron Ramsey, a Republican, dismissed the remarks as some more "crazy rhetoric" from the former Congressman, and Wamp later denied advocating for secession. Rubio's latest campaign acquisitions raise some red flags, yet his campaign has yet to address the controversial track records of these new members. Team Marco has not responded to Bustle's request for comment on the hirings of Wamp and Bertrand, nor whether their positions reflect Rubio's position on abortion rights. Planned Parenthood representatives, meanwhile, tells Bustle they see these recent hirings as a crystal-clear reflection of Rubio's own position on abortion. In an earlier statement, Planned Parenthood Action Fund President Cecile Richards pointed out that views such as Rubio's "aren’t reflective of the American public — or most Republican voters."